Queen Katherine by Linda Porter. This is about Katherine Parr, the sixth and last wife of Henry VIII. The one who lived. This book banishes some of the commonly held beliefs, for example that she was a dowdy old thing that nursed Henry in his old age. She was anything but, in fact she was being courted by the best catch of her day, Thomas Seymour, when Henry stepped in. She married Seymour in secret soon after Henry died. I was astonished to learn that she had been married and widowed twice before she married the King. Particularly as she never had any children by her first two husbands in spite of being married something like a total of 14 years. Her second husband got dragged into something called the Pilgrimage of Grace, a popular uprising protesting the dissolution of the monasteries. I'd never heard of this uprising either. 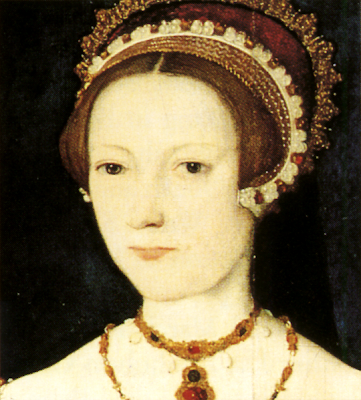 She had no children other than a daughter by Seymour; Katherine died within a week of giving birth. She only outlived Henry by just over a year. Her fourth husband was beheaded six months later for treason. I found myself counting on my fingers a lot while reading this book: people died quite young back then, for all sorts of natural and political reasons. Henry: I, Henry, take thee Katherine, to my wedded wife, to have and to hold from this day forward, for better for worse, for richer for poorer, in sickness and in health, till death us do part, and thereto I plight thee my troth. Katherine: I, Katherine, take thee Henry to my wedded husband, to have and to hold from this day forward for better or worse, for richer for poorer, in sickness and in health, to be bonaire and buxom in bed and at board, till death us do part, and thereto I plight unto thee my troth. And some of us women worry about having to promise to 'obey'! Putting this on my list of "to read"...while looking for it also ran across another one of interest: Sister Queens: The Noble, Tragic Lives of Katherine of Aragon and Juana, Queen of Castile by Julia Fox. I love this type of read. Thanks.